The Dingo Dancing Collaboration Project is a collection of artwork produced by Jay and Cass Purdon. 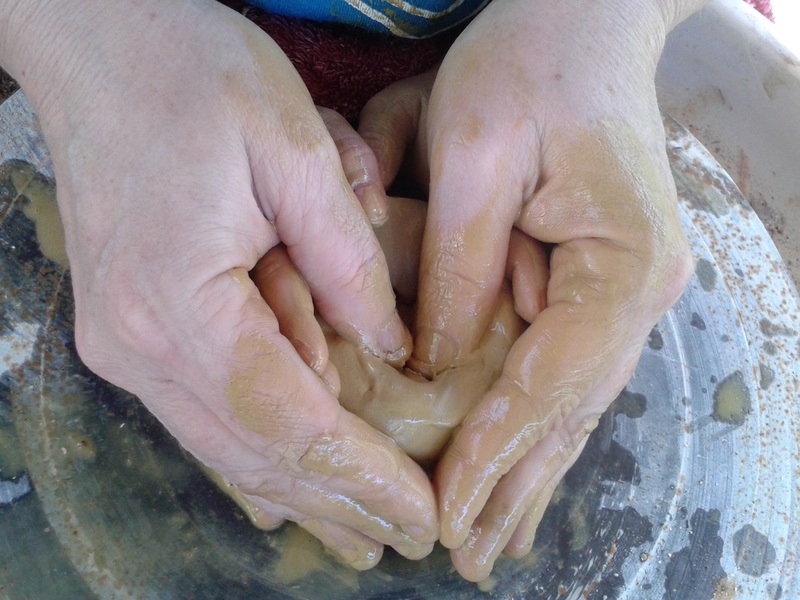 The Project was designed to be a learning tool to teach my son Bundjalung Language & Culture. Whilst teaching at EDA (Early Development Association) in Tokyo, Japan in 1986 I was first introduced to the Shinichi Suzuki philosophy of teaching children, he observed that children absorbed language based on their environment .Suzuki believes that talent is not inherited, but is a product of environment (1) = kids learn if the process is fun. So the aim of the project was to teach my son Bundjalung Language in a fun and informative way to ensure his cultural development by creating a visual outcome which was then exhibited at Gallery One29 in Lismore in May 2013. Why is teaching language so important? This project was designed to teach Bundjalung language and culture to my son by developing a series of art work that talks about ‘Country’. 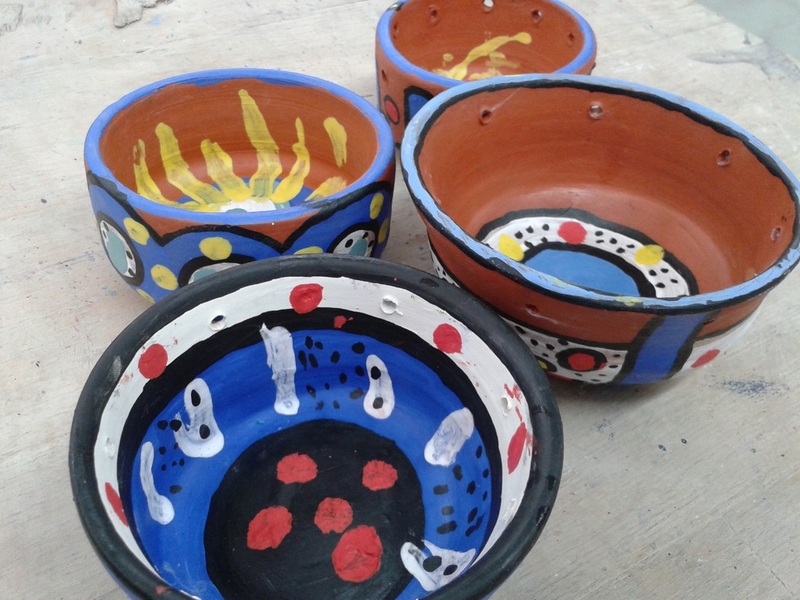 There are three main aspects to the work – ‘Walking through Country’ – ‘Talking about Country’ - & ‘Recording Our Experiences and Stories of Country’ in drawings/paintings which will then be used to decorate ceramic bowls. To have fun whilst experiencing all the above. The installation is the visual outcome of the processes Jay and Cass experienced by Walking through, Talking about and Recording of Country. The goal of the installation was to invite the audience to make the connection between all three. 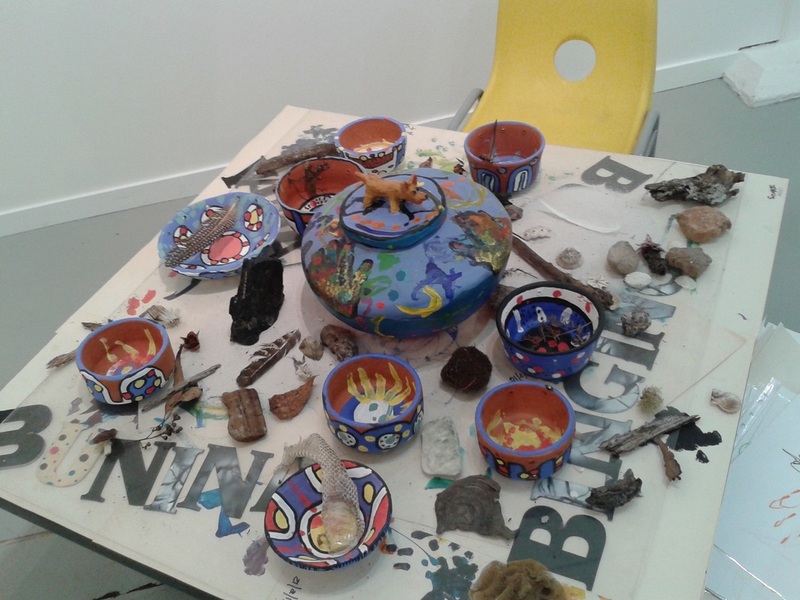 This was acheived by using a child's table and chairs, which the artists sat on to paint and draw (paper and bowls) to record their experiences, upon which the artwork (clay bowls/painting/drawings) was placed for viewing. Objects that were collected whilst walking through Country were also be placed on the table to make a physical connection to Country and lettering was used to represent Bundjalung Language & Culture. The Yurgiyn Dahnswena Project has now been published into a book. The book is 20 pages full colour with details and images of the project. Enquire about purchasing a copy. 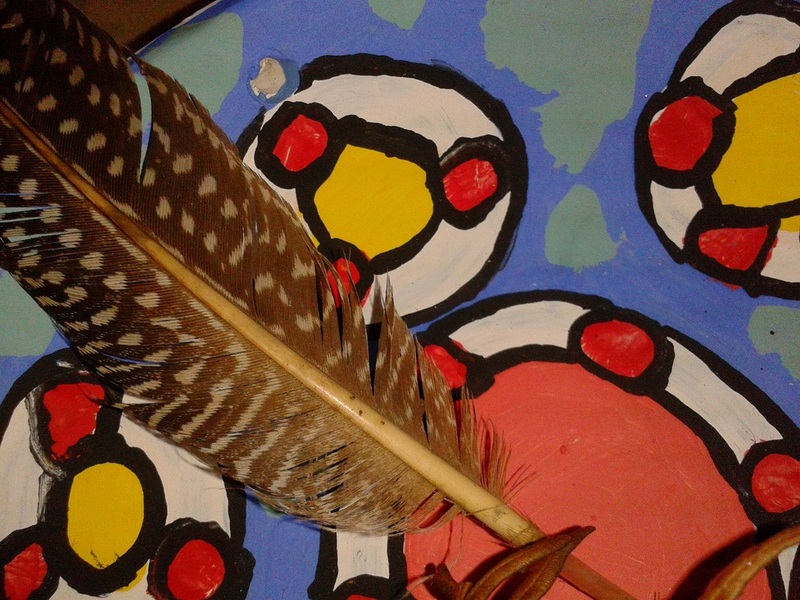 Jay is a Bundjalung boy who was three years of age at the time of this project. He lives in Bundjalung Country and aims to grow up and be strong and proud. His culture is important to him as it is part of his identity and is actively teaching his non-Aboriginal mummies what roles they play in helping him maintain his rightful identity. He paints for enjoyment, he walks through country for connection and pleasure and he actively connects both in this project. Cass is a 3D artist who resides in Bundjalung Country. She believes art has the potential to change the world and world views and that it is an artist’s responsibility to be a social observer, to record, document and inform the audience – artists are the society’s consciousness if you like. As a lesbian mum to an Aboriginal son she is only too aware of the importance to speak up against social injustice and this theme is ever present within this collaboration project with her son.